Gas hydrates, or clathrate hydrates, are crystalline solids resembling ice, in which small (guest) molecules, typically gases, are trapped inside cavities formed by hydrogen-bonded water (host) molecules. They form and remain stable under low temperatures – often well below ambient conditions – and high pressures ranging from a few bar to hundreds of bar, depending on the guest molecule. Their presence is ubiquitous on Earth, in deep-marine sediments and in permafrost regions, as well as in outer space, on planets or comets. In addition to water, they can be synthesized with organic species as host molecules, resulting in milder stability conditions: these are referred to as semi-clathrate hydrates. Clathrate and semi-clathrate hydrates are being considered for applications as diverse as gas storage and separation, cold storage and transport and water treatment. 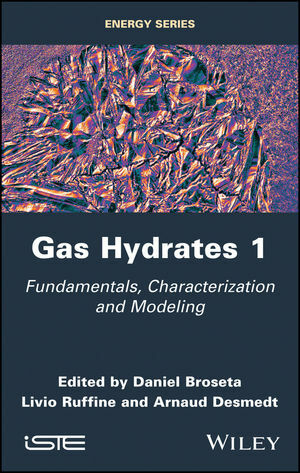 This book is the first of two edited volumes, with chapters on the experimental and modeling tools used for characterizing and predicting the unique molecular, thermodynamic and kinetic properties of gas hydrates (Volume 1) and on gas hydrates in their natural environment and for potential industrial applications (Volume 2). Daniel Broseta, University of Pau and Pays de l'Adour, France. Livio Ruffine, French Research Institute for the Exploitation of the Sea (Ifremer), France. Arnaud Desmedt, University of Bordeaux, France.